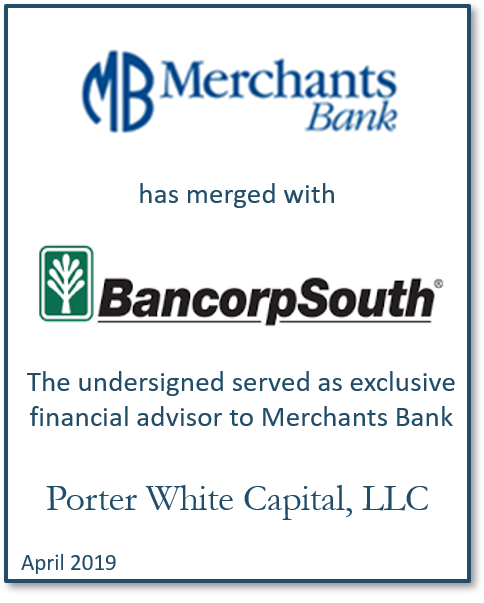 BancorpSouth-Merchants Complete Merger - Porter White Co.
On April 1, 2019 BancorpSouth Bank of Tupelo, MS (NYSE: BXS) and Merchants Trust, Inc. of Jackson, AL announced the closing of their merger that combines two well-respected banking franchises. The merger expands BancorpSouth’s presence in southwest Alabama, including the vibrant Mobile market. The merger consideration was a mix of cash and BancorpSouth stock. Porter White Capital, LLC served as exclusive financial advisor to Merchants Trust, Inc. and its subsidiary, Merchants Bank. Porter White has advised on six Alabama community bank mergers since 2016.